I would nedd some help on genomeCoverageBed tool. This tools when used for finding per base genome coverage uses an option -d.
I am actually interested in finding read counts for each base within a particular intron of a gene. Now this total count is basically the read count for the base G within that intron. This counts says that 6 reads have actually covered this base position(and hence base). 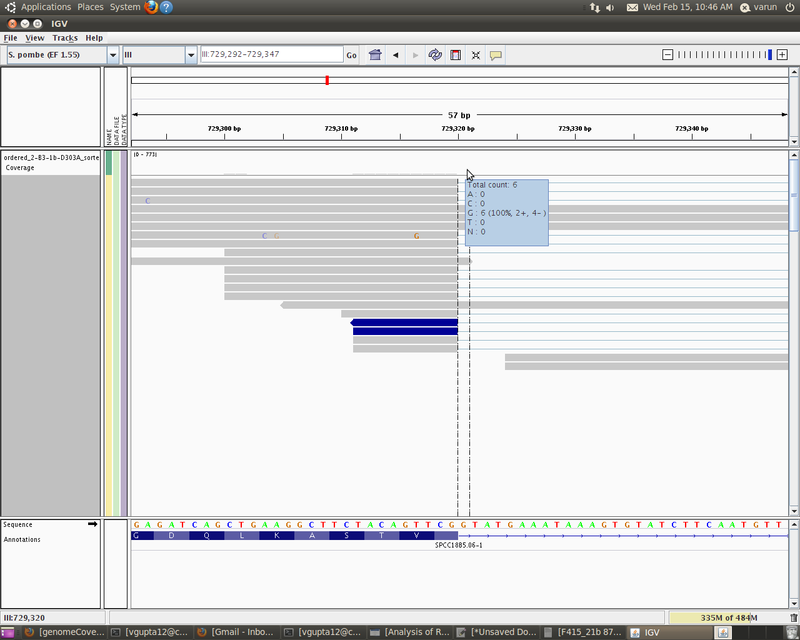 where 6 is the actual reads that has covered this base position(hence base) and 15 means that these reads have not covered that base at that position, but since the genomeCoverageBed tool calculates depth of feature coverage it also includes all those reads which skips that particular base. I would like to know how can i get only the read counts (here 6) for that particular base rather than getting the entire feature depth. I ran the above command and it gave me the per base genome coverage output for every base. What else should i do next to extract only the rread counts for that particular base. I can view it in IGV but want it in text format. Any command line or code will be helpful. What do you mean by reads that skipped the particular base? Do you mean reads that have a mismatch at that base? So 6 reads have a matching G, but 15 have mismatches? Nevermind my last question. I had a brain fart there. You are looking at mate pair reads, so you mean the inter-mate sequences that were skipped. Hi Well if you look at the graph it says read count as 6 but actually genomeCoverageBed reports it as 21. So that actually means that only 6 reads covered that base (G) whereas other 15 were skipped but are always counted in genomeCoverageBed(thin blue lines). You just need the -split argument, I think. Let me try with split..
Hi I tried using split but my bed file which i produced from the bam only contains 6 coloumns and not 12 as req for split. Did you got my question as to what am i trying to get. I have the same question about this, anyone help us? I have fix this problem use igvtools. The command line like this:I use the .wig filetype as the output type, .wig could use txt open, its contain A G C T N number. I think this is your answer. Required arguments: inputFile The input file (see supported formats above). outputFile Binary output file. Must end in ".tdf" or ".wig". To indicate that you want to output both a .tdf and a .wig file, list both output filenames as a single string, separated by a comma with no other delimiters. To display feature intensity in IGV, the density must be computed with this command, and the resulting file must be named <feature track="" filename="">.tdf. Getting The Average Coverage From The Coverage Counts At Each Depth. What Does "Intronic Depth" Means In Tophat Alignment Visual? What is mean that mpileup read depth (read count) 0? How can I calculate coverage from the base frequencies file?